What links a vintage postcard, a forgotten novel and a lost film? The answer - a small room in a Paris left-bank hotel. Since I began posting on Invisible Paris it has always been clear to me that there are certain subjects for which the blog format is not suitable. These slippery topics have stretched out over months, lead me on tangents in and out of Paris, and have never yet been published - until now. This particular adventure began with a simple postcard. It was not of a particular site or building, but instead just a dreary view from a 6th floor balcony. The perspective, looking out across the Place Saint Michel towards a barely visible Pont Neuf, was framed by jagged iron railings. 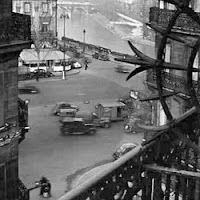 It was an ordinary postcard, but one that seemed to capture a singularly lonely and melancholic viewpoint of the city. Flipping it over, I noticed that the postcard had been produced to advertise “A Room in Paris”, a book published in 1955 and written by an author called Peggy Mann. As I had heard of neither, I purchased the card and set out to track them both down. This is that story. The result is a 10-page PDF document, but don't worry - it also includes a number of fascinating archive images! I also gave it a label: The Invisible Dossiers. There may be others - if their various tentacles ever lead towards satisfactory conclusions! Thanks to Betsy Houlton and her family for all their help in the creation of this document, in particular for sending me copies of the book, for answering my questions and for giving me access to the archive material. Bravo! This one is really terrific, I just wish I had done it! How lovely Adam! Thanks for sharing all your research and this book - must find a copy in the library. A beautiful piece of literary destective work. Bravo! Forgot to say my uncle studied painting on the GI Bill in Paris around the time of Mann's book. Somehow we think he just drank a lot of vin rouge. Thanks for an intriguing take on yet another American in Paris. Reading your blogs feeds my hunger for things Parisian between annual visits. The long form PDF suits your talents very well. always, it is: worth reading, you. Adam, this is a tremendous blog. Congratulations on your research, contacts and perseverance as well as your always interesting writing. Absolutely wonderful and beautifully written. Amazing how much history can be compressed into a postcard. Given time and a writer with a healthy dollop of curiosity and the persistence to follow the trail, the stories unfold and lead you to new places and new people. They also summon back the dead and tell their stories to a new generation. Bravo. Wonderful Adam just as your blog always is. This one in particular jogs my memory of my stay in Hotel d'Albe in July 2006 and in a room on that corner also! I can't remember the floor I think it was 3rd or 4th I will have to go search my records. I also must seek out the book. Merci! Thanks for all the positive comments. The postcard was an accidental find, but the research job was made easy thanks to all the great material Betsy was able to give me. It's always nice to get little snippets of extra information in these comments too. The GI Bill sounds like it must have been a great way to spend a few years in Paris! I thought I might have a reader who had once stayed in the hotel too, and I was always intrigued by its role in the novel and Peggy's life. I think I might send the current owners a copy of this PDF! Love this! I'm going to try to find the book. Thank you for keeping Peggy Mann's books alive. Beautiful piece, Adam. So evocative of a time and place. Thank you for again doing so much research for the benefit of your readers. I always really enjoy your blog, and this post is particularly lovely. Well done. For those of us who can't be in Paris, it helps keep it alive.